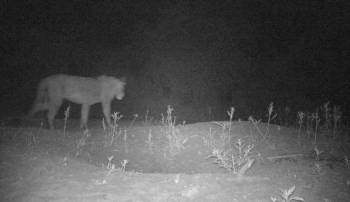 There could be as many as 183 lions and 198 hyenas living in a remote national park on the Sudan-Ethiopia border, a team of wildlife conservationists, supported by Born Free, has revealed. The discovery follows a survey in Dinder National Park (DNP), South East Sudan, conducted last month by a team led by lion conservationist Dr Hans Bauer from the University of Oxford’s Wildlife Conservation Research Unit (WildCRU) and in partnership with the Sudan Wildlife Research Centre, Born Free, and the Lion Recovery Fund. Dr Bauer returned to the area last month after confirming for the first time in 2016 that lions were living in DNP and Alatash National Park in neighbouring Ethiopia. These lions are of conservation interest because they almost certainly belong to the subspecies found in Asia and West, Central, and North Africa. This subspecies has sharply declined over the past two decades, with only an estimated 1,500 remaining. The latest expedition estimated the lion population in DNP at 157 (plus/minus 26) and the spotted hyena population at 180 (plus/minus 18). The team also sighted 24 different mammal species, including the rare and near-endemic Heuglin’s gazelle, and confirmed the presence of leopard, which were believed to be regionally extinct in DNP. The findings emphasised the important of DNP for savannah biodiversity conservation, he added. The team plans to return to DNP to continue to survey the lion population there.